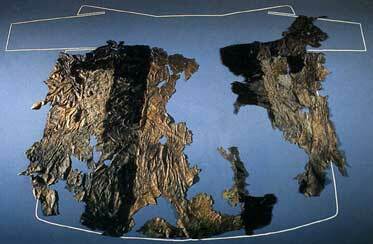 A few fragments of the Iceman's upper garment, mainly consisting of hide from a domesticated goat, have survived. 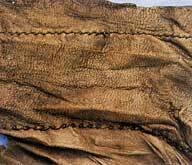 The shirt was made of long, rectangular strips of skin that were joined by over-sewing on the inside, with animal sinews used as thread. The different colored vertical strips of skin may have been intended as a pattern. No pieces of the shoulders of the garment were recovered, so there is some speculation as to whether the Iceman's shirt had sleeves. The upper garment likely reached down to the Iceman's knees. Since there are no sign of fasteners, it is assumed that the Iceman's upper garment was closed with a belt. 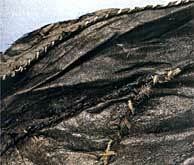 Fragments of the Iceman's belt, made of calf leather, show that his belt was originally about six feet long, therefore reaching around his hips twice. A piece of sewn-on leather formed a small pouch that contained five items including a drill, scraper, and a flint flake. A black mass of tinder fungus filled most of the bag. Traces of pyrites were found indicating that lumps of pyrite were used by the Iceman to create sparks. 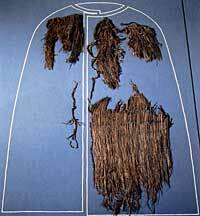 The Iceman's cloak was made of long stalks of Alpine grass and was open at the front. The original length is thought to have been about 90 cm and would have covered the Iceman's entire torso and his thighs. Some Alpine shepherds wore grass and straw cloaks for rain protection into the 20th century. 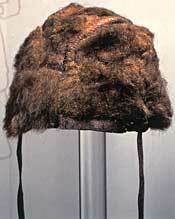 Bearskin headgear was discovered during the second examination of the site. The Iceman's cap was made of the pelt of a brown bear and had two leather thongs attached to the lower rim for the purpose of tying it under the chin. Originally about three feet long, the Iceman's loincloth consisted of long, narrow strips of goat hide joined by over-sewing with animal sinews. 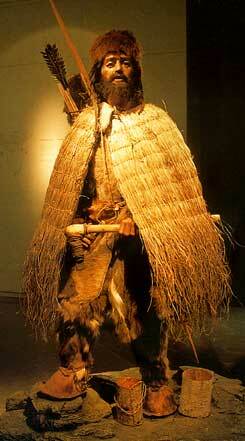 The loincloth would have been drawn between the Iceman's legs and fastened at the front and back with a belt. The Iceman wore leg protection that covered the thighs and lower legs, therefore not really a pair of trousers. The leggings were made of goat hide with a deerskin strap sewn onto one end that could be tied down when doing up the shoes, preventing the leggings from riding up. Similar loincloths and leggings were also worn by North American Indians well into the 19th century. When Iceman was recovered, the right shoe was still on the mummy's foot. The shoe consists of an oval leather sole with turned up edges that were held in place using a leather thong. A woven net of grass was attached on the inside to hold hay in place acting as protection against the cold. 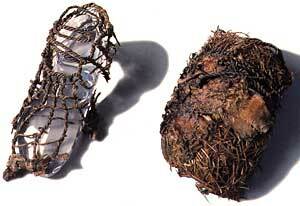 The Iceman's shoe was closed with a leather upper that was attached to the sole using another leather thong. The shaft around the ankle was bound with grass filaments to prevent moisture from getting into his shoes. The soles of the shoes were made of brown bear skin. The uppers were make of deerskin and were closed using shoe laces.